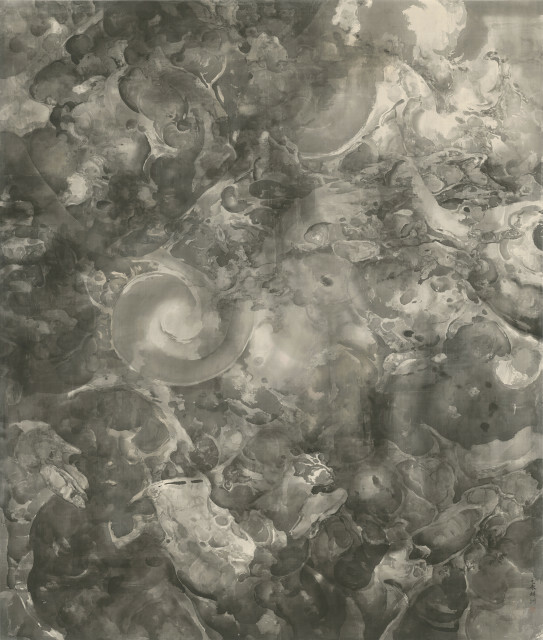 INK studio presents the new paintings and installation of celebrated artist and scholar Tai Xiangzhou in the solo exhibition Speculative Cosmologies. Opening on Saturday, March 18, 2017, Speculative Cosmologies is part of the inaugural Gallery Weekend Beijing. It is co-curated by Britta Erickson, INK studio Artistic Director, and curator Alan Yeung. Tai Xiangzhou was born in 1968 in Ningxia to a scholarly family. As a youth he studied calligraphy with the exiled master Hu Gongshi (1912-1997), roamed the vast deserts of the northwest, and absorbed the diverse cultural legacies of the Silk Road. After relocating to Beijing in 1986, he worked as an art conservator and mounter and enjoyed successful careers in digital design and cultural media. In the 2000's, he devoted himself fully to his artistic practice and began to study under ink painter Liu Dan. Tai proceeded to earn a doctorate from Tsinghua University with a dissertation on the origins of Chinese landscape representations in classical cosmology, particularly its elaborate systems of correspondence between the celestial, terrestrial, and human realms. Working in the literati mode, Tai spent years copying and mastering classical compositions and brushwork. He focuses on the landscapes of the Song Dynasty (960-1279), considered a Chinese golden age for both pictorial and astral arts. Speculative Cosmologies features select examples of Tai’s classicizing style, including Mountain of Heaven, a virtuosic rendition of a Song monumental landscape as a screen—a format charged with cosmological significance; Cosmic Symphonies, an elaboration of a celebrated 13th-century album depicting different aspects of water; and Microcosm-Macrocosm, a primordial landscape without organic life generated from a miniature scholar’s rock. Lovingly and intimately antiquarian, these paintings also ask, speculatively and counterfactually, what a Song landscape would be if it encompassed the vastly expanded scope of contemporary knowledge and experience. Tai’s distinctive cosmic scenes form the bulk of the exhibition, displayed alongside actual iron meteorites in his collection. The monumental nine-panel ensemble Parallel Universes immerses the viewer in the serene chaos of cosmogony, with gnarled and perforated rocks hovering in space without coherent illumination, perspective, orientation, or even causality. The rocks recur within and across compositions, transposed and rotated and morphologically transformed, and seem simultaneously to emerge from and dissolve into the atmosphere. Elsewhere they resemble the fossils and bones of an archaeological past or a post-apocalyptic future. Subverting pictorial conventions and removing the viewer from ordinary reality, the cosmoscapes reinvest vision with visionary potential and images with imaginative power. Painting thus becomes a medium not only for representation or expression, but also for speculation at the grandest scale, pertaining to the nature of space and time and the possibilities of invisible or even imaginary universes. Similarly, the interactive architectural installation The Gateway of Expedient Means connects heaven and earth and reconciles rational thought, empirical experience, and metaphysical wonder. Modeled on medieval revolving repositories of Buddhist sutras, the installation is constructed in wood using traditional mortise-and-tenon joinery. The viewer is invited to enter and circumambulate it as in a ritual for karmic merit, and to contribute to a library of shared knowledge by writing on its blank string-bound volumes.